Mr. Hankins is the Director of Patient Support and Social Services for the Winship Cancer Institute. James Hankins is the Director of Patient Support and Social Services for the Winship Cancer Institute. He is a licensed clinical social worker who has focused his career on providing counseling and support services to patients and caregivers coping with medical illnesses. 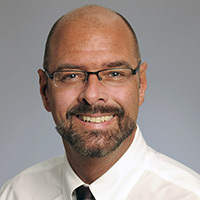 Prior to joining Winship Cancer Institute, Mr. Hankins came from Portland, Oregon, where he worked as a therapist in private practice and worked as an oncology social worker for the Providence St. Vincent Medical Center. Mr. Hankins is a graduate of Michigan State University and received a Master of Social Work from Wayne State University in Detroit, Michigan.